Kurien Ouellette LLC is active in West Hartford business affairs and has been a longstanding supporter of the West Hartford Chamber of Commerce. 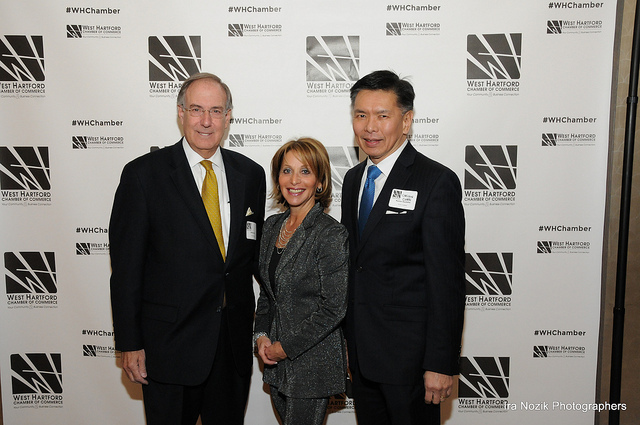 Here, attorneys Jeffrey Brine and Carlton Chen join Mayor Shari Cantor just prior to her delivery of the 2019 State of the Town speech. Jeff is currently serving as the Chamber’s Legal Counsel and is a member of the Chamber's Board of Directors and its Executive Committee, and previously served as a Chamber Ambassador. Carlton previously served as the Chamber's First Vice Chairman, its Second Vice Chairman, a Board member, and the Chairman of its Manufacturers Roundtable. If you would like to hear from us on a regular basis, please enter your email address. We promise not to flood your inbox! Notice: The use of our website does not create a lawyer-client relationship between you and our lawyers. Such a lawyer-client relationship is created only by an express agreement with a lawyer that is confirmed in writing by our firm. Unless you are already a client of ours, no communication with Kurien Ouellette or its lawyers is a confidential communication, and we are not required to respond to or to maintain any such communication.